Nancy’s story is not just a film – it is part of an unstoppable movement to empower women, rising from within the remote parts of Africa to join in with the voices of others from across the world. Stories are perhaps the most powerful tool to shift social norms, particularly across a continent where the oral tradition is strong. All the key moments of Nancy’s life during the last 6 years are captured on film as events unfold, giving it the drama, jeopardy and excitement of a fictional film. Yet it is a true story which we intend to have impact and change lives. Statistics do not begin to tell the truth of women’s experience. Grass roots stories, told by the women themselves, articulating the desire for change, (which is rising within the communities from where the practice originates) can bring their world to life and inspire change in others too. Like ripples from a stone thrown into water, each girl can impact other girls and as ripples join other ripples a movement for change becomes unstoppable. Nancy A One Girl Revolution is about this change – one girl at a time. Leading to a girl revolution! Powerful stories can speak truths that are otherwise difficult to hear. They can influence opinion formers to speak out; these leaders can go on to educate and enlighten whole communities to the true impacts of FGM and child marriage. Over time this can transform the tribe’s social norms. The enormous scale of the problem indicated by the figures mean that we must support those on the ground facing the challenge of making these changes. Nancy’s tribes’s story of transformation can help spread the message, and create a domino effect within the region – girl by girl, village by village, tribe by tribe. The film will amplify the impact of the movement and help unlock more significant cultural change. Nancy wants to take her film to the remote places where most NGO’s do not, or cannot reach. Her purpose is to break the cycle of violence passed from mother to daughter, and help end FGM and child marriage within her generation. Nancy’s generation is the first generation to challenge these traditional practices. From girl to girl, woman to woman, from heart to heart the world can be changed. There are very few feminist heroines in such remote places, whose lives are recorded on film. Our film will help make the lives of Nancy and many other women who live far out in the African rural villages, more real and visible. We also hope it will change how girls in remote rural villages are viewed forever. Nancy will gather people in villages, classrooms, churches and market places to share her film in person to encourage girls to resist and parents to support them. Change that is generated by communities for themselves ensures change is sustainable over the long term. Our plan is to support Nancy to have the largest impact possible, screening a ‘field version’ of her film to encourage change through education for girls and parents, as well as fostering greater leadership from other community opinion leaders. The film will help hold officials to account for their responsibility to reduce child marriage and gender-based violence, and even encourage greater implementation of legal sanctions. Showing Nancy’s life in intimate detail makes it possible to see beyond statistics and understand real women’s experience. Her story is so archetypal we believe it can build bridges across culture and continent, to tell a story which connects to women around the world – and all those who share Nancy’s desire to achieve their full potential. Whilst her story is deeply rooted in her tribes pastoral tradition and experience. The film reflects this, for it is made at the grass roots, by the grass roots and for the grass roots. Yet it’s themes are universal. The first version of the feature length film is uniquely designed for use within African communities to inspire the younger generation of women facing the knife, as well as to influence parents, elders, officials and chiefs. Nancy wants her story to spread far and wide, reaching even the hard to go to area’s within her community where cutting is still the norm. The film’s title is not intended to make Nancy unique but to inspire others to realise the potential within themselves – for it takes a huge collective effort to change a culture. 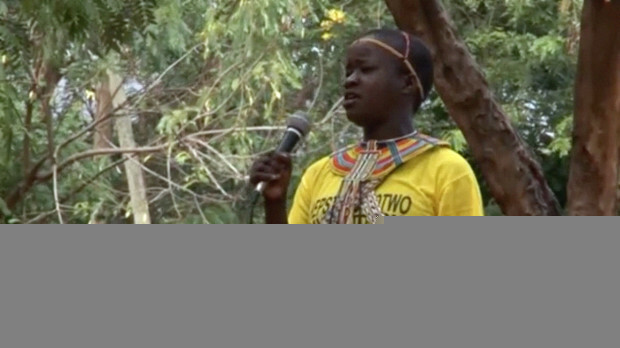 Nancy’s story demonstrates the huge loss FGM and child marriage has on the development of the whole community as well as the wellbeing of individuals. She believes that once the taboo is broken and women speak out, men will no longer be able to live in denial of the consequences for the women and their families. Nancy is the first woman in her family’s lineage to publicly challenge the traditional culture. There are many girls wanting to join her, but fear and the need to conform holds many of them back – but Nancy’s story can inspire her generation to have the courage to speak out, including the men. Nancy’s upbringing in poverty in a mud compound on a remote hillside did not hinder her courage and passion to empower herself as well as follow her own inner guide, rather than the dictates of the crowd. Her story has an archetypal quality – simply because she transcends her circumstances and demonstrates the possibilities for others to refuse to be a victim of destructive practices and reach for their dreams. Fear of speaking out, has held the practice in place for centuries, even when individuals are aware of the harm caused, they often conform. When the film is show to communities it can help unravel the myths that keep the practice in place, and reveal to the men of the tribe who rarely hear of women’s experience, the truth about the numerous harmful impacts of FGM. Nancy’s film is the first time some women will have broken the centuries of silence and taboo in order to speak out. For women have even been unable to share the truth with their daughters. Nancy publically breaking this taboo, with support from others within the community helps others to do so too. The barrier to discussing the negative impact of FGM is kept in place by what is known as pluralistic ignorance, where there are many people who silently opposed to it, but fear to say so. Women’s inequality means a woman’s voice is not valued and she fears banishment if she speaks up. For men consider the women (they have bought with bride price) are their property, and they must obey the husbands command. Opinion leaders can shift the communities social norms by standing up and breaking the silence about the real impacts of FGM. Role models who have remained whole can demonstrate the benefits of abandoning the practice and play an important part in encouraging others to resist. For they are living proof that uncut girls can have successful and happy lives. These harmful traditional practices have massive and undocumented life and death implications (The Pokot Health Department did not, as of 2016, collect data on deaths from FGM or complications due to FGM in childbirth. Therefore evidence of the financial and developmental costs to the wellbeing of the family, the community and the tribe can be overlooked as a central priority. FGM alone also damages emotional and sexual bonds between men and women. Beyond that gender inequality is linked to low levels of development. The longer film demonstrates all of these impacts observed by following the story of real people. The second version will be cut as a multi-layered feature documentary for an international audience. Nancy’s narrative is in many ways the story of ‘every woman’ and a classic heroes/heroines journey in which the main protagonist faces numerous trials in order to obtain transcendence and become a leader of her people. This universal narrative quality in which the central character triumphs over victimhood, violence and adversity to obtain wholeness and serve the wider community, gives it a deeper and wider appeal. The international version will have subtle commentary which explores the psychological impulses which connect the history of women’s inequality and struggle in the west with that of Nancy’s experience. For Patriarchy and violence against women, (and even other men) at this deeper level is a universal experience, even if the level of violence is a matter of degree. Women and men in the west can identify with Nancy’s struggle perhaps not so much in the unique threats of violence from cutting but in the similarity of her journey to transcend obstacles to living the fullest most empowered version of herself. Nancy is an archetypal heroine and her story is embedded within the women’s movement which began with The Suffragettes. The film will peal the layers of misogynistic projection and explore the deeper subterranean rivers that run beneath the surface culture and serve to justify this misogyny. Women are accused of promiscuity if childbirth is difficult and they can be forced to confess to adultery, if it is considered that the difficulty is as a result of a curse. If a girl dies when being cut, she can be said to be cursed, and left to bleed to death alone. These projections of witchcraft and sexual promiscuity are echoes of our own not so distant history in the West in which innocent women were sent to their death at the stake, accused of witchcraft, or being brides of Satan. Clitorectomies were performed on ‘hysterical’ women within the last 100 years and men locked up the wives ‘they owned’ with chastity belts. There are generations of women proceeding our own generation who had few choices but to conform. My hope is the second version will have a long life as a classic story of a woman’s triumph over her circumstances. The intention is for it to be shown online, on broadcast TV, and educational distribution in campuses, community’s and classroom screenings too. Nancy’s story is an intimate portrait which transforms the nameless statistics quoted at UN briefings, into visible human beings with important lives. It gives women in these remote areas a real voice and international visibility. This can also have an impact in ethnic communities in the west. There is no greater motivation for change than to see change coming from the communities of origin. Within the west the film can also be used to bring awareness and keep pressure on Governments and encourage support for men, women and girls at the grassroots. We would like Nancy’s film to encourage greater funding for programmes which support community led change as well as the opinion formers and role models who are driving change at a local level. The international feature length version will also explore how Nancy’s grassroots activism intersects with the wider international framework and explore how international organisations and NGOs are viewed from the community level. There are many across the world that believe that at the root of the current ecological and social crisis is the repression of the feminine principle – oppressed for over two or more millennium. For our species to survive an evolutionary leap in consciousness is required. Nancy’s vision is a world where genders are more equal and women have a voice. She desires wholeness, connection and balance – a desire that women across the world are articulating louder and louder. Hillary Clinton echoed this when she said “Women are the largest untapped reservoir of talent in the world. It is past time for women to take their rightful place, side by side with men, in the rooms where the fates of peoples, where their children’s and grandchildren’s fates, are decided.” Even the Dalai Lama himself said it was women who would save the world. The Commonwealth Secretariat and The Rt Hon Patricia Scotland, Commonwealth Secretary-General invited Nancy to the launch of the Commonwealth’s initiative: Empowering Girls and Women: the role of Health and Education in Eliminating Violence Against Women as a panelist and guest speaker for the 25 November – the International Day for the Elimination of Violence Against Women. It was a joint event with the Commonwealth Girls Education Fund and there was a screening of a short version of Nancy’s story, followed by a panel discussion. The Commonwealth Girls Education fund had originally been formed from the Commonwealth League by Myra Sadd Brown a well known Suffragette. CGEF had supported Nancy and other girls shown in the longer film, in recognition that empowering an ambassador like Nancy would have a great impact. The CGEF has a natural connection to the girls who are leading change in other parts of the world as a result of this connection to the Suffragettes. Baroness Scotland made a powerful speech asking the audience to pledge to three actions they would take as a direct result of attending. Nancy gave a passionate and spontaneous speech, which demonstrated to all in the room her commitment to be a generator of change. A short clip of her speech is in the film on the home page. One of the most interesting guests was Lady Diana Dollery who understood more than most, the challenges Nancy was facing as a pioneer on the front line. Lady Dollery is the granddaughter of Myra Sadd Brown, a well known Suffragette who had been a hunger striker when sent to prison after she threw a brick through the War Office’s window. Nancy and Diana agreed to meet at the Women’s Library at the London School of Economics where her grandmothers papers were held. Nancy had not known about the Suffrage movement which had begun the movement for women’s liberation around 100 years before, when women had campaigned for the vote. She was inspired by their stories and their commitment when facing the hostility that sticking their heads above the parapet can attract. Nancy connected with Myra’s story in particular because she had recently experienced an attack by some of her family members who had thrown stones at her and her one year old son. Members of her family had been disappointed because her husband of choice had not brought them the bride price, and she had failed to deliver expectations. 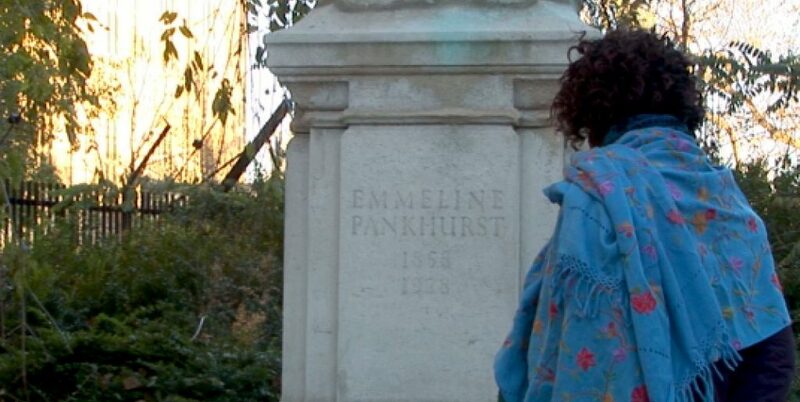 Whilst visiting Parliament Nancy visited Emmeline Pankhurst’s statue. She was learning about the long history of persecution of women in the West as well as Africa …connecting with their story and the price they’d paid to challenge political paradigms and demand the inclusion of women in shaping cultural life. Like the Suffagettes Nancy faces entrenched values – yet it is the same impulse as the Suffrage movement emerging from within women in the remote African regions. Not long ago Kenya celebrated 50 year of Independence. 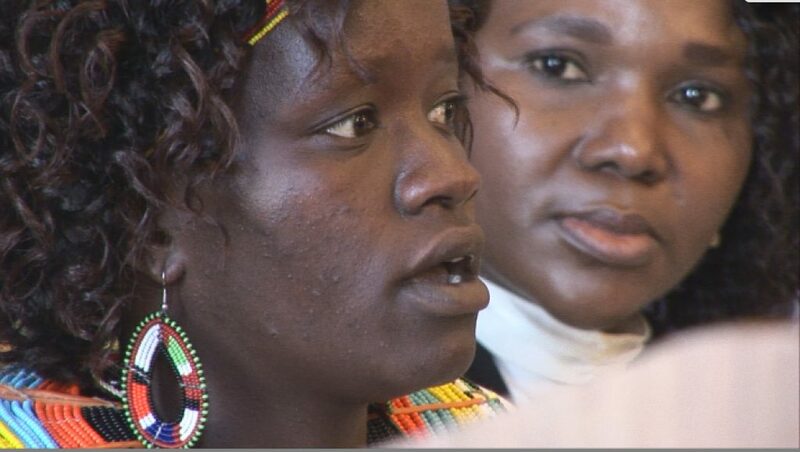 Yet in Kenya’s hundreds of square miles of bush, women are trapped in unspeakable suffering. Nelson Mandela said before he died that, “Freedom cannot be achieved unless the women have been emancipated from all forms of oppression.” Yet in Africa 3 million girls are at risk annually, leading to trauma and suffering that impacts every aspect of tribal life. Sara was originally supported with seed development funding by the Commonwealth Broadcasting Association WorldView (funded by DFID) for initial research into Nancy’s story due to it’s proven potential for impacting lives after she had already made a short film about Nancy. Sara’s first short film about Nancy, made in 2010 for Christian Aid, inspired people across the world when shown on The Guardian online and Al Jazeera television. It won the 2012 People’s and Judges Webby Award for Best Documentary and was a finalist for The Rory Peck Sony Impact Prize. Sara’s film made a big impact and firmly established FGM on the UK media agenda before the story had begun to be told more widely.